We’d love your help. Let us know what’s wrong with this preview of UDL Now! by Katie Novak. To ask other readers questions about UDL Now!, please sign up. Be the first to ask a question about UDL Now! This book gives teachers a clear view of UDL and tons of practical examples. I love how the evidence is intertwined with research to give you motivation and logic in one strong dose to get you moving foward! 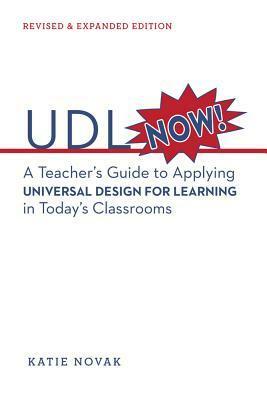 If you are a UDL junkie, or just UDL curious this is the book for you. very helpful textbook as a pre-service teacher - I am very intrigued and would hope to incorporate all the UDL principles in my lessons. A bonus - my Technology in Education professor, who recently was nominated for an award at Winthrop, wrote part of the text! I enjoyed this book, but found I utilize many of the ideas and have many of the mindsets. I learned some new things that I am excited to share, but this book is very beginner udl. I liked the classroom examples. Some of the ideas seem far fetched based on reasonable resources. Overall, the book had solid information and was easy to understand. A lot of common sense, good teaching strategies. If you are using best practices in your classroom , you are probably already using many of these techniques. Great resource for teachers! Practical ideas to create an environment for all children to learn how to learn. Another professional text that got me thinking about what/how/why I do things in my classroom. UDL has so much potential in the classroom. I really like the fact that the emphasis is on the student and helping the students to step up to the expectations rather than. adjusting the expectations. learning is not meant to be easy but that's when students are more likely to learn. Katie Novak, Ed.D. is an internationally renowned education consultant as well as a practicing leader in education as an Assistant Superintendent of Schools in Massachusetts. With 15 years of experience in teaching and administration, an earned doctorate in curriculum and teaching, and 4 books published by CAST Professional Publications, Katie designs and presents workshops both nationally and int Katie Novak, Ed.D. is an internationally renowned education consultant as well as a practicing leader in education as an Assistant Superintendent of Schools in Massachusetts. With 15 years of experience in teaching and administration, an earned doctorate in curriculum and teaching, and 4 books published by CAST Professional Publications, Katie designs and presents workshops both nationally and internationally focusing on implementation of Universal Design for Learning (UDL) and universally designed leadership.